Keeping the head down causes most amateur to get wristy with chip shots. Keeping your head UP allows the body to turn while chipping. Most amateur get wristy with chip shots which results in poor contact. When the body stops turning the wrists become more active. Keep your head out of the way so the chest can turn freely towards the target. After some practice, you should start to make crisp contact and not even think about your head. Correct example of keeping your head up. Nothing will help you lower your scores more than chipping close to the pin around the green. 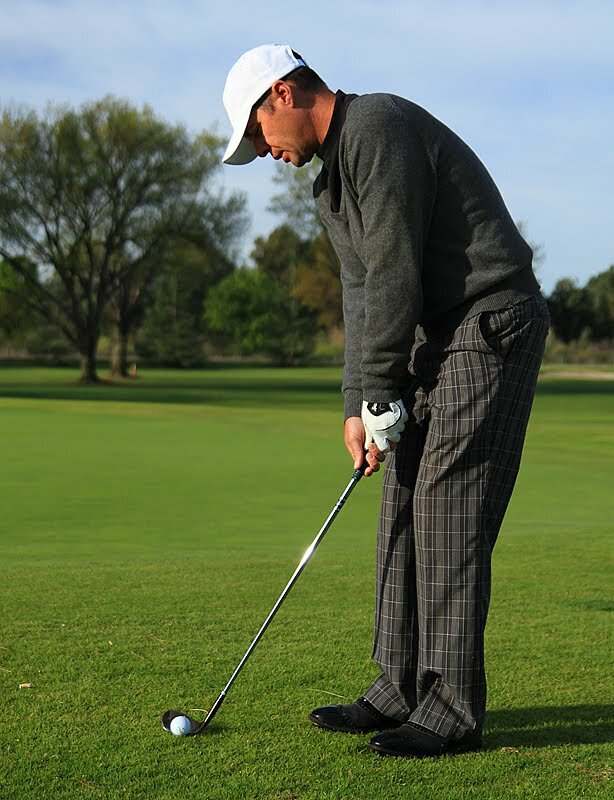 Try these tips next time you practice your short game. Most golfers put little time into chipping and get frustrated. I guess I would too! I hope this serves as a start for proper form in the chipping stroke and inspiration to put more time into your short game. 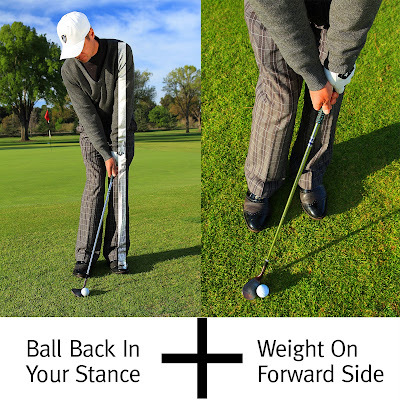 The ball placed back of center allows the hands to stay ahead of the club. Proper contact between the club face and the ball is the key to controlling the distance desired. This can only be achieved if the handle leads the club head at the point of impact. Without proper form feel cannot develop. Having the weight of the body favoring the front leg encourages a descending blow on the ball rather than scooping it. If you are struggling with inconsistent contact, put more weight on the front leg and get ready for crisp chip shots. Bobby Hinds is a Teaching Professional at Woodley Lakes Golf Course with over 10 years of teaching experience. If you have questions about your golf swing, email Bobby atbobbyhinds@aol.com He is available for lessons through the Pro Shop. For more information, go to BobbyHinds.com. I am a PGA professional with 30 years of experience in the game of golf. I have learned a fundamentally sound system that will improve every part of your game. Long term improvement happens only when a mental change occurs and the construction of a philosophy begins. 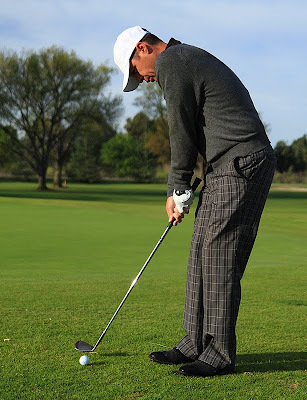 The goal of this program is to help you understand the chain reaction of your golf swing. Knowledge of cause and effect relationships eliminates guesswork and builds trust and confidence. In this educational process I will help you find your own best swing, not the swing that works for someone else. Let me help you improve your game through a formal education on the fundamentals. Your score will be lower and you will have more fun in the process.